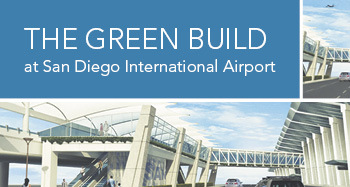 Join The Daily Transcript and San Diego County Regional Airport Authority in celebrating the grand opening of Terminal 2, "The Green Build," at San Diego International Airport. The San Diego County Regional Airport Authority announced Wednesday that the U.S. Green Building Council has awarded the airport two separate certifications for its Terminal 2 expansion. San Diego County is one of the world’s leading craft beer destinations, and recognized for the variety, character and quality of its local brews. So, it’s only fitting that San Diego’s largest craft brewery -- Stone Brewing Co. -- will soon be featuring new locations at San Diego International Airport. Pizza is arguably one of the most popular, well-known food items in the world. So needless to say, Tommy V’s Pizzeria was destined for San Diego International Airport. Pizza lovers will find Tommy V’s in Sunset Cove in Terminal 2 West. Tired fliers with a layover at San Diego International Airport can grab a cup of coffee, catch up on CNN on 50-inch TVs, Skype with a friend across the country or grill some burgers — all free. The new 10,000-square-foot facility, named after military vet and supporter Neil Ash, is the largest USO airport center in the world for active-duty service members and military families. The plan for shifting passenger access and processing to the north side of the airport is taking shape as the completed Green Build developments to the south look to take advantage of them in the future. The following are the board members and executive leaders of the San Diego County Regional Airport Authority. You may be surprised to learn that San Diego is home to the oldest family owned and operated bookstore in the United States, Warwick’s. And come Tuesday, travelers will be able to make a stop there without even leaving the airport. Back in 1985, Su-Mei Yu opened San Diego’s first authentic Thai restaurant on India Street’s restaurant row. Over the years, some of Saffron Thai Grilled Chicken’s best customers have been pilots, flight attendants and air travelers headed to San Diego International Airport. Qdoba Mexican Grill is a major player when it comes to Mexican restaurants, with more than 625 locations in 44 states, the District of Columbia and Canada. Yet despite the popularity of Mexican food in San Diego, a location has not yet made it on the map. But that will soon change -- Qdoba is opening its first San Diego restaurant at San Diego International Airport summer 2013. The center is named in honor of Neil Ash, a dedicated supporter of our nation’s military service members and the visionary behind the creation of the first USO center at San Diego International Airport. When developing a project, all parties involved are looking for the best value for their investment. That is why finding a company that can help you with the installation of structural concrete, and the design and installation of site concrete and decorative concrete, is both time-effective and efficient. Instead of hiring three separate concrete companies, developers can rely on one San Diego firm to install all three types of concrete. That company is Concrete Contractors Interstate. When the 460,000-square-foot Green Build expansion officially opens to the traveling public on Aug. 13, the new shops and restaurants just might convince passengers to arrive a bit earlier for their flights. Welcome to a special section detailing the many dimensions of San Diego International Airport’s largest-ever improvement project -- The Green Build. Completed on time and expected to come in at more than $45 million under budget, the improvements offer significant benefits not only to those who use SDIA, but also to the San Diego region as a whole. "The Green Build," the largest construction project in the San Diego International Airport’s history, is nearly complete. Celebrating its grand opening Aug. 8, The Green Build includes a three-story, 460,000-square-foot expansion of Terminal 2. The project began construction in 2009, and will be completed on time and under budget. To say the San Diego International Airport Green Build Landside Project was built with the community in mind would be an understatement. From early community input into the design, to local subcontractor involvement, added sustainability elements, and the construction of the world’s largest United Service Organizations facility at an international airport, the $227 million Terminal 2 landside improvements are the result of significant community involvement. The $907 million expansion of San Diego International Airport dubbed “The Green Build” has far exceeded expectations in getting done on time and under budget, and in funneling work to local businesses. Back in August 2010, the level of construction activity at San Diego International Airport’s Green Build project was highlighted by foundational pile driving tests, and preparing for the demolition of the second pedestrian bridge standing in the path of a new dual-level road in front of Terminal 2. The Terminal 2 expansion, which is what the piles being tested were needed for, hadn’t even begun yet. Fast-forward three years later. The light at the end of the terminal has been reached. There’s a reason it was called "The Green Build." Now that it’s complete, the San Diego County Regional Airport Authority expects Lindbergh Field to be among the most sustainable airports in the nation through decreased water usage, reduced energy consumption and the use of alternative energy sources. Its tropically landscaped planters, smooth wide benches and sturdy in-sidewalk light posts make the curbside passenger-pickup zone at Terminal 2 a pleasant place to wait for a ride, day or night. In an effort to reduce airport traffic congestion and improve customer service, a new Rental Car Center is now in design for the San Diego International Airport. Williams & Sons Masonry Inc. The craftsmanship of Todd Williams' company is on display all over the San Diego area: all block buildings at Cathedral and Mater Dei high schools, the new parking structure at Rady Children's Hospital, brick veneer on the new Scripps Prebys Cardiovascular Institute in La Jolla, and block walls at the under-construction County Administration Center Waterfront Park on Harbor Drive. Few companies appreciate the road it took to transform San Diego International Airport into a world-class facility more than the company that designed it — the road, that is. Before design consultants made modifications to any existing utility lines at Terminal 2, they consulted a subsurface utility map created by San Dieguito Engineering Inc. (SDE) It was their roadmap to the myriad cables, pipes and conduits that went over, under, around and through the massive project. From floor to ceiling, everything literally had to be on the level at Terminal 2. So the San Diego County Regional Airport Authority called on Nolte Vertical Five (NV5), one of its longtime on-call consultants, for surveying and engineering services. The national firm's San Diego office had performed those services for the Authority for more than 10 years. Aug. 6, 2013 -- Reporter Carlos Rico gives a behind-the-scenes look at the new Terminal 2 at San Diego International Airport. Construction has been completed on the $907 million project, called The Green Build, and it opens to all travelers on Aug. 13.